Logic board does not recognize the home button? I've replaced the ribbon cables to the iPhone home button, and the home button was still not recognized. I went ahead and tested the home button that I repaired in another phone and it worked fine. It is evident that it is the logic board that doesn't recognize the home button functions. It appears as though this phone encountered some water. Any help to get this resolved would be excellent! You also need to clean connector 4 as this connects home button to motherboard. If that doesn't work you may need a new dock connector. I've seen this home button failure problem numerous times with the 3Gs and water damage. I came across a fix a while back that allowed me to fix 2 water damaged logic boards that had lost home button function at board level (replacement of home button flex cable did not resolve) that I had figured I'd tried everything on. 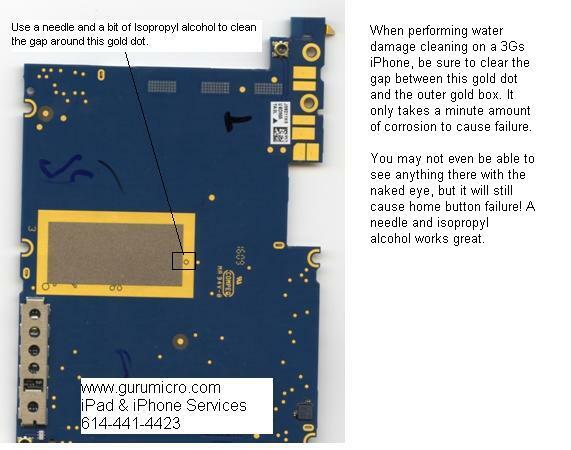 I'm posting a link to an image that shows the area on the backside of the logic board that need close inspection and further cleaning with a needle to resolve. I switched out the dock connector as I noticed the two blobs where it made contact. It still had the same issue which lead me to believe that it was the logic board itself. I also switched logic boards and kept all the same connectors in place and the home button began working with the different logic board. Do you have any other suggestions or potential solutions? I appreciate your help. have you checked the prongs under the home button? just lift them up a bit more- they may not be making contact with dock. Try this solution first! it worked for me!!! however this had me stumped as i had tested the contacts (even tried a new screen) all so tried a new dock and still the same fault. Hey presto this cured my problem!! The phone had been in water although there was no evidence of this anywhere.